The first thing anyone asks when you tell them you are going/went to Frankenmth is if you got chicken. J and I have actually been to the city twice before this trip and neither time did we get chicken. Why, you ask? Family style. Neither of us is going to eat enough to make it worth it. There are two huge chicken restaurants right across the street from each other. Both are owned by the Zehnder family. At one time, they really were owned by the same person, but nowadays, they’re two separate entities with a friendly rivalry. I made the decision before we even got on the road, that we were going to get our chicken from the Bavarian Inn. My plan was to hang out in the hotel and just do take out chicken. I would love to actually eat in the restaurant, but like I said, we’re not gonna do the family style thing with just the two of us. I did learn, however, that the luncheon menu is available all day. They don’t advertise that really well and, as a consumer, I wish they’d just put on their dinner menu that you can order chicken plates. If either menu is available at any time, then why are there two separate menus? We may have eaten there had I known that ahead of time. Since we didn’t know that, we decided to do carry-out instead. J called in the order around 5:30. Her plan was to order a five piece bucket of all white meat plus two orders of fries. When she was on the phone, the guy taking the call said something to the effect of, “oh, you don’t want the sides that come with it?” He thought she was ordering a five piece meal, but really, we just wanted the bucket. She said, sure, we’d take them. When she said that, the order taker took that as meaning we didn’t want the fries anymore. That wasn’t the case. We still wanted the fries, but he assumed that since we took the meal instead of the bucket, we just wanted the sides that came with it. Around 6:00, I headed to the Castle Shops to pick up the meal. The nice thing about carry-out is you don’t have to go in to the crowded restaurant. They have 15-Minute Parking and Curbside-To-Go spots right outside the entrance to the Court Jester Cafe. There were several bags sitting on the counter when I walked in. I grabbed a Pepsi and a Sierra Mist from the cooler and headed the cash register. I told the clerk my name and that I had a carry-out order. She went and grabbed a ticket, but not the bag. She rang up the ticket and the two pops. The bill was a little under $25. After paying, I walked over to the counter with the bags and started looking for mine. Another employee saw me doing this and came over to help. After getting back to the hotel, J pointed out we didn’t have any plates, napkins or silverware. It was going to be hard to eat chicken and fixins without those things, so I headed back out to Kroger to get what we needed. Finally, after that little shopping trip, I got to dig in to some chicken. J and I both prefer white meat, so we just went ahead and paid the extra $2.00 to get all white meat. The surprising thing to me was that all five pieces were breasts. They weren’t the huge breasts that you get at the chain chicken places, but they were meaty, moist, delicious breasts. The breading was golden brown and crispy with just a slightly salty taste. I was a pretty big fan and ended up eating four of the five breasts myself. J said it as good, but she wasn’t getting a whole lot of flavor. As for the sides, I didn’t really try any of them, because there wasn’t really anything I liked. J and L ate quite a bit of the mashed potatoes. L also had a couple scoops each of the dressing and cole slaw. She didn’t say much about any of it. I think we both would have rather had the fries, but we know for next time to specify the box over the meal. I know I still have to actually get to the Bavarian Inn restaurant some day, but I was really happy with the chicken. The overall experience wasn’t a total success, but I would definitely go back for the chicken. J thought some of the appeal had to do with the restaurant being a tourist place. It’s one of those experiences you will always remember. 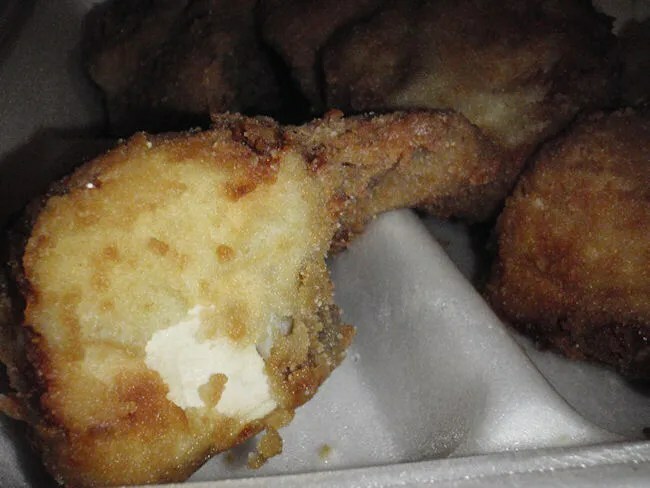 I don’t doubt that has something to do with the legendary chicken in Frankenmuth, but my opinion is they’re also serving up some pretty good fowl. I humbly think you kind of did a small dis-service to the Bavarian Inn and Frankenmuth in general with this review. 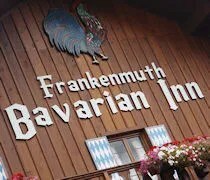 I read your blog pretty much every time you do a new review, and generally think you do a bang-up job, but as a frequenter of Frankenmuth I feel the need to say a few things. At least you did acknowledge how good the famous Chicken is! HOWEVER, you do NOT need to order the renowned Family Style Chicken Dinner in the restaurant, not even at dinner time. You can order a 2 or 3 piece meal, that is not all-you-can-eat, but does include a reasonable serving of the more popular sides….which are all home-made, and sometimes as good or better than the chicken (but I can honestly say I’ve NEVER had fries there!). 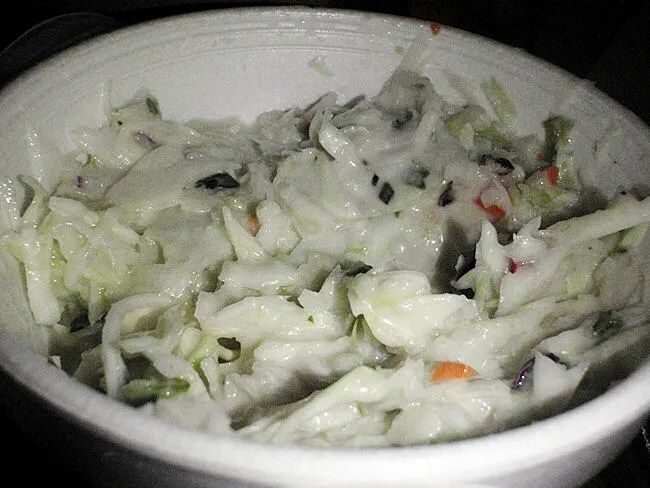 In particular, I find the cabbage salad, aka “cole slaw”, to be unique (at Zehnder’s, anyway), and extremely good. I always order some in the deli located downstairs to bring home. Now I tend to eat more at the original Zehnder’s, across the street from the Bavarian Inn, but I have been to both places. There are small differences in the meals, but nothing too noteworthy. I would also point out that both restaurants ALSO offer much more than just the Chicken, with focus on German favorites like Sauerbraten, Wiener Scnitzel, Sausage, and Rouladen, not to mention sides like the delicious Blaukraut, and Buttered Spatzle. They also have a nice selection of German beers and wines, and offer a locally micro-brewed Root Beer and flavored lemonades for those choosing to avoid alcohol. 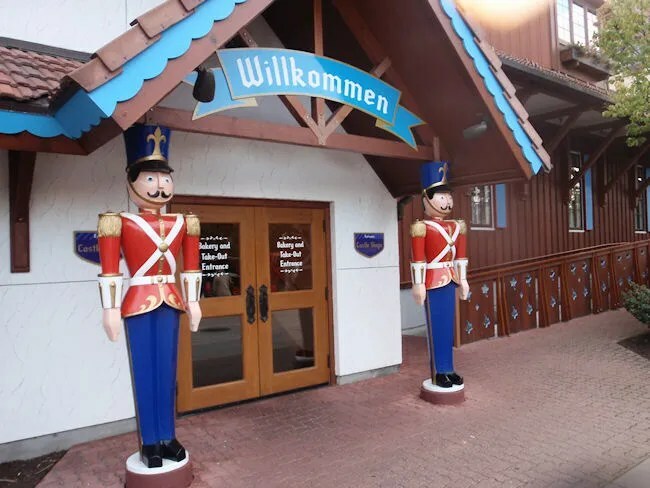 I’ll be honest….Frankenmuth is my favorite day trip in Michigan, but of course I know I’m not alone in that sentiment as the town is one of the most popular tourist destinations in our state, and can be crowded, especially on the weekends. Also, as in many tourist areas, the food can tend to be a bit pricey. You definitely CAN save a little by going at lunch time, as you kind of alluded to, where you can enjoy pretty much the same menu as at dinner, but at a reduced cost. When my family and I go, we like to eat first (generally getting there between 11 am and Noon), then we “walk it off” by walking around town and shopping or browsing in the many shoppes. There is often something going on in town, and any time of year is a good time to go in my opinion. 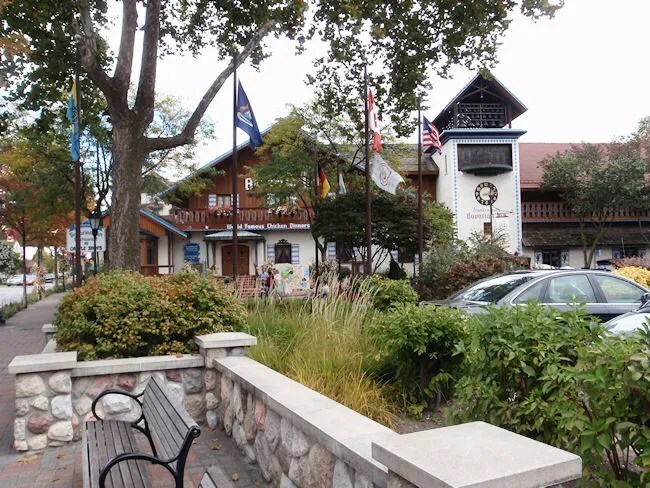 I really think a big part of the Frankenmuth “experience” is actually dining IN one of the restaurants, so I hope you take the time to do so in the future! The only thing I’ll disagree with you on is I don’t think I did anyone a disservice by giving an honest account of our experience. As I mentioned in the post, the fact that there is a luncheon and dinner menu…and both are always available is confusing and that’s probably the single biggest factor that turned me off from dining in. Had I known before we go to the hotel and settled in that we could order off the luncheon menu, we probably would have went to the restaurant for dinner. As far as the beers, I’d rather drink local crafts than imported German….so that does nothing for me. I liked the food and definitely want to give the restaurant (as well as Zehnder’s) a shot in a future trip. I will only say I tried to be as gentle as possible in my admonishment. Please take no offense. I understand you are only reporting your experience, so perhaps it was uncalled for. The reason I would do so at all is because in a review of a place like the Bavarian Inn, it would seem that atmosphere and service by the wait staff would be important to include, as the establishment is far more than a take-out place, and it is such a long drive from SW Michigan. Most of the readers would probably choose to dine in. By the way, the Bavarian Inn owner, William Zehnder, used to operate a take-out place, named Freeway Fritz, which shared a building with a Shell gas station at exit 144 on I-75 (Bridgeport), but it closed in 2008. As is probably obvious, I’m just a big fan of Frankenmuth in general, and both restaurants specifically, and may have gone overboard in my defense of the subject at hand. Perhaps its my German heritage? Anyway, I only mentioned the German beer and wine as part of relaying the whole German-centered experience, and the Bavarian Inn does advertise as having the largest selection of German beer in the state. You can’t argue with the German influence on American beer. Heck, the founders of both Miller and Anheuser-Busch were German immigrants. We certainly wouldn’t have the booming micro-brew industry we have in this country nowadays without the legacy of German-style brewing laying the groundwork. I did enjoy your reviews of the Frankenmuth Brewery and the Frankenmuth Fudge Kitchen! I’ll mention that the Frankenmuth Cheese Haus is also one of my favorite stops in town, and has some of the best aged Sharp Cheddar I’ve ever enjoyed. They have some cheeses that have been aged 12 years or more….and cut blocks right off the wheel. Talk about intensely sharp! They also have a huge selection of uniquely flavored cheeses, including chocolate cheese. Its definitely worth a stop if you like cheese. No offense taken, I understand your point. The point of this post was mostly about how we didn’t realize you didn’t have to do family style….as I’ve already said, had we known that, we probably would have eaten in. There are a couple more posts on my old blog, midmichigandining.com about a previous trip to Frankenmuth…the Cheese Haus is one of those as well as Bronner’s, Mac’s Fudge, and Black Forest Brew Haus…if you click on Mid-Michigan Reviews and go to the Frankenmuth section, you can find those…I actually still have one more to write from this previous trip, but haven’t found the time. You should have gone family style- even for two people. 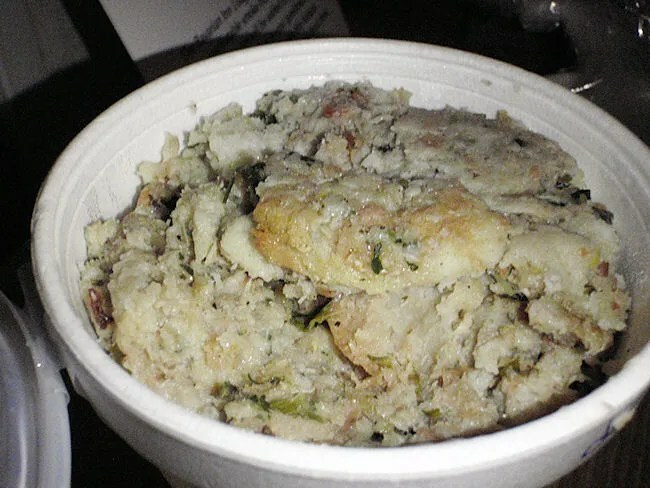 Ever since they got caught years ago reserving pieces left from other families serving dishes- they now let you take home at least one bowl of what ever you do not finish. So you eat all the chicken and ask for a second helping- then you take that and some noodles or what ever home. Their Chicken really is devine and despite this small problem they got caught at years ago (mind you it was not off eaten plates but from the family bowl) they are still worth going too. Heck, as we midwesterners say, you have no idea what goes on in the kitchen of most restaurants. We sadly miss freeway fritz- you could get all you wanted to go and they had a small dining area where you could get plates and utensils too. The frequent freeway road work killed stopping off there and they closed.